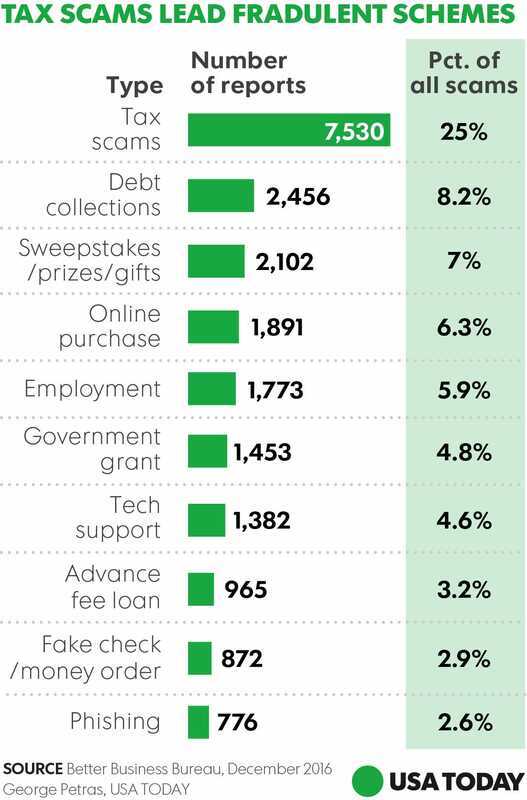 Fake debt collection claims and phony announcements of sweepstakes wins, prizes or gifts maintained their hold on the next two spots in the scam ranking for the second consecutive year. Like the IRS scammers, crooks running the debt schemes often demand payment for non-existent utility or credit card bills, said Hutt. Sweepstakes scammers, meanwhile, announce what seems to be news of a financial windfall — and then seek a purported tax payment or other fees as a condition to get the never-to-arrive winnings. “People get excited about hearing they’ve won, and don’t always think to check it out,” said Hutt. New to the list in 2016: Online purchase scams, taking the list’s fourth spot. In some cases, online websites offering sales of gifts or other goods are completely phony, said Hutt. Other times, they feature counterfeit goods. Either way, unsuspecting consumers can get burned. Employment scams, which round out the list’s top five, are among the most insidious frauds, said Hutt. Scammers typically place online job ads that offer generic positions and often feature purported work-from-home options. Typically, consumers who respond to the ads are ‘hired,’ and then asked for personal information, including Social Security numbers. “The scammers can get everything they need for identity theft schemes,” said Hutt. Scams typically change over time as thieves and con artists “keep track of what works and refine their operations,” said Hutt. Although it’s impossible for consumers to keep track with all suspected schemes, the BBB offers precautionary measures to avoid becoming a scam victim. Never send money to anyone you haven’t met in person. Don’t click on online links or open attachments in unsolicited emails. Don’t believe everything you see, even if an email or website looks genuine. Never buy online unless the transaction is secured by using “https” in the URL (uniform resource locator). Be cautious when dealing with anyone you’ve met online. Never share personal identifying information with someone who contacts you via unsolicited emails or calls. And don’t be pressured to act immediately. “It’s trite but it’s true: If it sounds too good to be true, it probably is,” said Hutt. Original article published on www.USAToday.com.